Over the years, the eCommerce industry has witnessed a significant growth by becoming a trillion dollar market and is projected to grow further. While the improvements in various technologies have influenced both users and industries alike, online merchants have realized the need to be a step ahead in order to be noticed. They have realized that the first step towards increased sales is to focus on various Search Engine Optimization (SEO) techniques. For this reason, Magento has become the most favored eCommerce platform because of its out of the box SEO features. From getting a visitor’s attention to your website to converting him into your customer, SEO has a significant role in your business’s virtual recognition. But unlike other industries, SEO for eCommerce websites can be quite complex and require specific skills during each process to impact your sales. 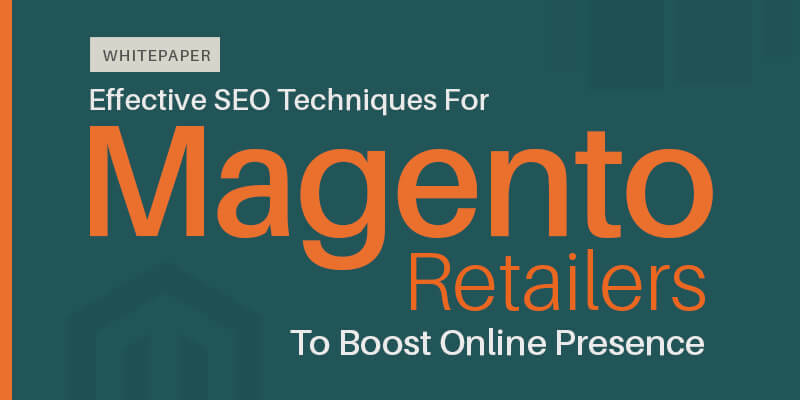 For retailers who have understood the need to boost their online presence, we have crafted a whitepaper with the help of our Magento Architects that will explain how you can implement some of the real time SEO techniques that can improve your search engine rankings.